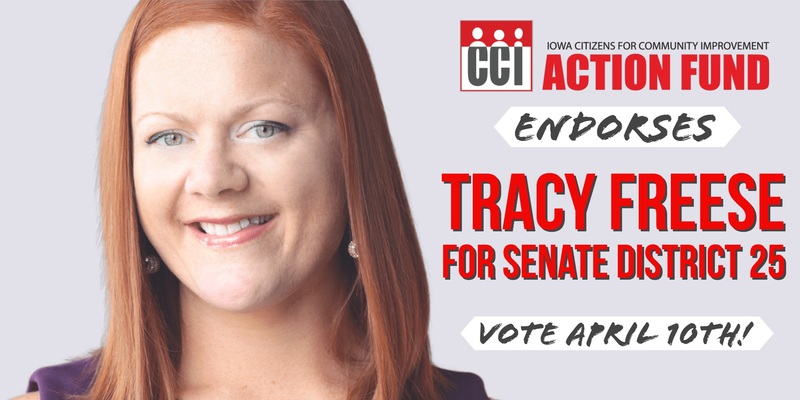 We have a big announcement to make: CCI Action is endorsing Tracy Freese for State Senate! Then, when Dix resigned from the Senate earlier this month, Tracy threw her hat in the ring for the April 10th special election to replace him. This race is a big deal: it’s a chance to elect a people-first champion right in the heart of factory farm territory. 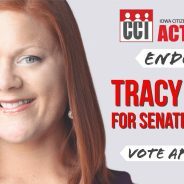 That’s why the CCI Action Board of Directors voted to assemble an endorsement committee to check out Tracy’s campaign, and decide whether it would make sense to endorse her. We put together an issue questionnaire for Tracy, and then the endorsement committee of members from Senate District 25 reviewed her answers and met with her in person. After that meeting, the committee decided that Tracy lined up with our values: she supports universal healthcare, the Fight for $15, and a moratorium on factory farms. Members voted to endorse Tracy – and now we have 12 days to put that endorsement to work. Our power is in you: our members. You are how we accomplish change, through protesting, showing up to meetings – and talking to voters. You are how we’re going to win on our issues, and one piece of that is getting Tracy elected. To that end, we’re in the process of organizing a series of phone banks, door canvasses, and postcard parties to talk to voters around Senate District 25 about our issues, and about Tracy’s campaign. 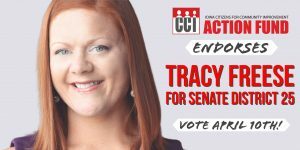 Can we count on you to help Tracy get elected? We even have ways you can volunteer from home – so sign up today to help elect Tracy. This race is a big opportunity for us. The Farm Bureau and the Pork Producers have plenty of champions in the statehouse – it’s time we elect some champions of our own. Here is a list of polling locations for the April 10 special elections. Note: Story County residents in SD25 can vote at any of the following locations. Thank you for all you do – let’s make the most of this opportunity. LIKE and TWEET to share this announcement.